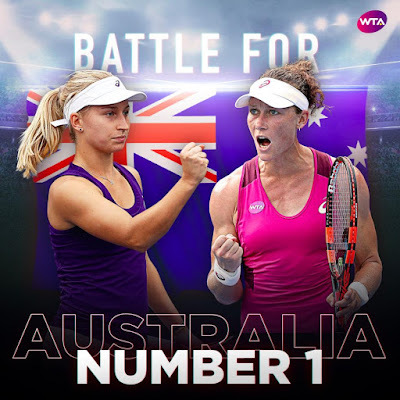 Tennis aces Samantha Stosur and Daria Gavrilova will clash for the Australian No.1 ranking on French Open eve after setting up a high-stakes final in Strasbourg. In a mouth-watering Roland Garros appetiser, Gavrilova is gunning to end Stosur's remarkable record-long 450-week reign as Australia's queen of the court after continuing her hot claycourt run with a 6-4 6-2 semi-final dismissal of Caroline Garcia. Under siege following a near-decade as national No.1, Stosur responded with an equally impressive 7-6 (7-0) 6-4 victory over Peng Shuai to lock in the first all-Australian WTA title decider in 12 years. Win or lose on Saturday night, both stars will head to Roland Garros for the season's second grand slam event brimming with belief after storming into their first finals of the year. But the opportunity to land her maiden career title and knock Stosur off her perch to further underline her credentials as a genuine Open contender is Gavrilova's big motivator. 'I'm ready. I'm really hungry to win a tournament,' the 23-year-old said after dispatching Garcia in 76 minutes for her seventh win in eight matches on European clay. While presently separated by just one spot in the world rankings, Stosur is 10 years Gavrilova's senior and hopes the gulf in experience will help. 'It's a big thing to try to win your first final. I was in eight finals before I won one,' said the one-time world No.4. 'I had some very close ones but couldn't quite get there, so I know exactly what that feels like to be in a new situation you haven't experienced very much to get over that hurdle. It can be a big moment. The last time two Australian women met in a top-level tour finale, Alicia Molik denied Stosur her maiden title with an epic 6-7 (5-7) 6-4 7-5 in Sydney before following up with a captivating run to the 2005 Australian Open finals in Melbourne.